Wart causes can be a bit of a mystery. There is often no indication that anything out of the ordinary has happened, yet an unsightly growth has developed. The explanation behind this is the fact that warts are caused by a virus known as human papillomavirus (HPV) that enters the body through tiny cuts, scrapes, or other abrasions. There are over 100 different strains of HPV, but only a few of them cause these growths. 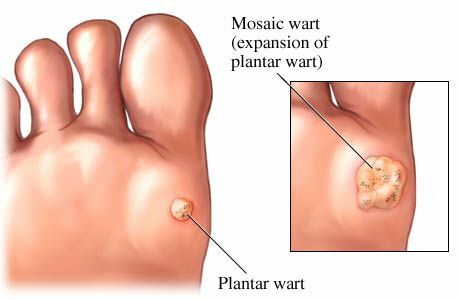 A common misconception about a plantar wart is that it has “seeds.” This notion comes from the fact that tiny black dots are often seen through the translucent growth. Those aren’t seeds, though. Actually, they are simply the ends of blood vessels that are now visible. The HPV that causes the growths can often be found in warm, damp environments or is passed along from skin-to-skin contact. Walking barefoot on pool decks or gym locker rooms and showers increases the risk of viral contamination. Another common cause is touching a wart and then touching one’s own skin. Unlike with some other common foot issues, a wart that goes untreated will typically disappear in time, but that might take up to a couple of years. Given the contagious nature of these viral growths, a better idea is to have them treated. There are home treatment options, including kits that can be bought at the store and unconventional methods (like using duct tape), but the results are not always guaranteed. The best way to address the problem is to take advantage of the effective, professional care we provide here at Austin Foot and Ankle Specialists. Contact our office for the specific treatment methods we offer. It is important to note that attempting to use at-home care could potentially increase the risk for infection. This is something you may want to keep in mind when determining whether or not to attempt this form of treatment on a child. If you have any questions about at-home treatment methods for children, contact our Austin podiatrist office and we will be glad to answer them for you. Make sure your child knows to not touch a wart, whether it is his or her own or someone else’s. Doing so increases the risk of the virus being transferred and a new growth developing. Protect your child’s feet. Microorganisms tend to thrive in warm, damp environments. Thus, make sure your child wears shower shoes or sandals if he or she is walking on a pool deck, in a gym locker room, or using a communal shower. Use good hygienic practices. Your child should wash his or her feet daily to keep them clean and free of microscopic threats. Make sure that he or she uses soap in addition to water! Keep his or her feet dry. Feet can provide the warm, damp environment that viruses, bacteria, and fungus need, so make the area less hospitable for them by having your son or daughter change socks and shoes if they become wet. Another good practice is to ensure that your child is completely drying his or her feet before putting on socks and shoes. Always be sure to use these prevention tips to reduce the risk of your child growing one of these unsightly bumps, but keep in mind that it is impossible to completely eliminate that risk. If your child, or any of your family members, does end up with a viral growth on the foot, you can find the professional care you need here at Austin Foot and Ankle Specialists. Call us at (512) 328-8900 for more information or take advantage of our online form to schedule an appointment today.